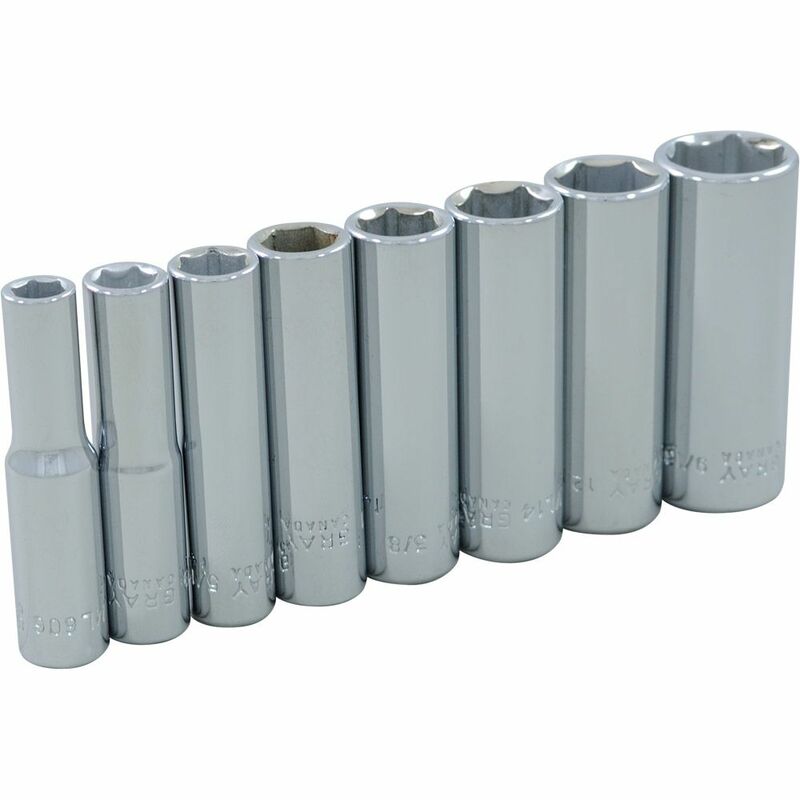 The sockets in this 8 piece 1/4" drive 6 point SAE deep chrome socket set feature outstanding corrosion resistance as a result of our proprietary in-house plating process. In addition, Gray sockets are made from premium tool steel for maximum durability and feature a distinct brilliant jewellery-like finish. Made in Canada and backed by Gray Tools worry-free lifetime warranty. Contains Sizes: 1/4", 9/32", 5/16", 11/32", 3/8", 7/16", 1/2", 9/16". The 1/2" Drive Pear Head Ratchet has a 5 degree arc swing and a slim head design making it easy to manoeuvre in constricted areas. The product is easy to use with one hand and its low profile directional lever helps to reduce catch points. Husky's Speed Collar Impact Extension Bar provides comfort and added protection to the user's hands when used with an impact driver. The Speed Collar allows the user to maintain a firm grip on the tool while still allowing the shaft to spin freely. Collar quickly adjust to two different positions or can be completely removed providing multi-application use. Socket Set 8 Pieces 1/4 Inch Drive 6 Point Deep Sae The sockets in this 8 piece 1/4" drive 6 point SAE deep chrome socket set feature outstanding corrosion resistance as a result of our proprietary in-house plating process. In addition, Gray sockets are made from premium tool steel for maximum durability and feature a distinct brilliant jewellery-like finish. Made in Canada and backed by Gray Tools worry-free lifetime warranty.